Welcome to Church Of The Living Word. Thanks to you and the faithful supporters of COTLW, 2019 will be another great and blessed year of ministry. Many people receiving Jesus as Lord and Savior, and will have been filled with the Holy Spirit. Through sound doctrine and bible teaching they are also being trained up in the Word of God. 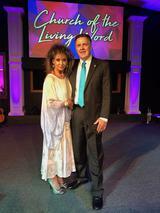 Jan.1 2019 we began our 35th year as founders and Senior Pastors of Church of The Living Word. Believing the best is yet to come... Jesus is Lord! Looking forward to year 36. Building familes is Word and Faith... 2019 Moving to a Higher Level! Non-Denominational Word of Faith, Family Church. Subscribe to Podcast and watch recent messages in iTunes. Download Soaping Journal Here. A daily personal Bible Study designed to help you grow as a Christian. Sunday Worship Service 10 a.m. Wednesday 7 p.m.